The quote of the day has to be Bernie Sanders saying “I disagree with Hillary Clinton on virtually everything,” in an interview with the The Boston Globe. However, as I will get to below, looking back at old statements from Hillary Clinton on gun control, her views were quite similar to views expressed by Sanders, making her attacks on Sanders look rather calculating and hypocritical. His more aggressive posture toward Clinton is part of his strategy to draw clearer distinctions between his liberal record and her shifts on major issues including gay rights, the environment, and trade. Sanders said he was “delighted” that Clinton, the former secretary of state, recently said she opposes the mammoth trans-pacific trade deal. But he noted that she remained silent earlier this year when liberals were trying to find the votes needed to help block legislation. He also pointed to her recent decision to oppose the construction of the Keystone XL pipeline, an issue that was being studied by the State Department when she was in charge of it. …During his discussion with The Globe, he cited multiple examples of issues where has tried to defend the middle class by on taking powerful interests and casting unpopular votes. They included his votes against both wars in Iraq, his opposition to the Defense of Marriage Act which defined marriage as a union between a man and a woman. During the interview, Sanders conceded that he did not do enough to beat back the false charges of sexism and racism from Clinton which I discussed yesterday. He has voted to ban military-type assault weapons, said he wants buyers at gun shows to submit to background checks, and said that he wants to do more to prevent so-called straw purchases, in which a person prohibited from buying a gun legally circumvents federal background checks. Well, I come from a state which has virtually no gun control. 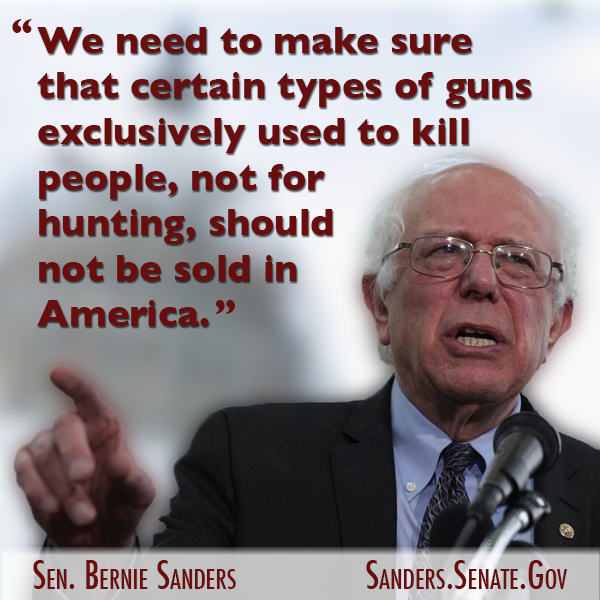 And in Vermont, guns are seen as something people use for hunting, target shooting, antique gun shows. But I realize, and Vermont has realized, that guns in Detroit and Los Angeles are used to shoot at police officers and to commit terrible crimes. So, I believe that we have to do everything we can to make sure that guns do not fall into the hands of people who should not have them. Period. I’m not sure why the caption on the You Tube video refers to her as “Lady Clinton” but this is the only clip I could find which contains the pertinent portions on gun control. Notice how evasive she is, how she flip-flopped on the issue, and how she raised the same ideas which she attacks Bernie Sanders for. Rather than specifically discussing Vermont as Sanders has, Clinton noted how the situation in New York City is different from Montana or outstate New York. The transcript from this portion of the debate (including portions cut from the video) is under the fold. MR. GIBSON: On that point, we’re going to take a break, a commercial break. The Democratic debate from here in Philadelphia before the Pennsylvania primary will continue. Stay with us. We’ll be back. (Applause.)(Announcements. )Back to the Philadelphia Debate, the Democratic Debate, just less than a week now before the Pennsylvania primary.And I would be remiss tonight if I didn’t take note of the fact that today is the one-year anniversary of Virginia Tech. And I think it’s fair to say that probably every American during this day, at one point or another, said a small prayer for the great people at that university and for those who died.It also, I suspect, makes this an appropriate time to talk about guns. And it has not been talked about much in this campaign and it’s an important issue in the state of Pennsylvania.Both of you, in the past, have supported strong gun control measures. But now when I listen to you on the campaign, I hear you emphasizing that you believe in an individual’s right to bear arms.Both of you were strong advocates for licensing of guns. Both of you were strong advocates for the registration of guns.Why don’t you emphasize that now, Senator Clinton? SEN. CLINTON: Well, Charlie, on Friday, I was with Mayor Nutter,who’s here, in West Philadelphia at the YMCA there, to talk about what we could do together to bring down the crime rate that has ravaged Philadelphia.You know, more than one person, on average, a day is murdered in Philadelphia. And Mayor Nutter is very committed, as the mayor of this great city, to try to do what he can to stem the violence.And what I said then is what I have been saying, that I will be a good partner, for cities like Philadelphia, as president. Because I will bring back the COPS program, the so-called COPS program, where we had 100,000 police on the street, which really helped drive down the crime rate and also helped create better community relations.I will also work to reinstate the assault weapons ban. We had it during the 1990s. It really was an aid to our police officers, who are now once again, because it has lapsed — the Republicans will not reinstate it — are being out gunned on our streets by these military-style weapons.I will also work to make sure that police departments in Philadelphia, Pittsburgh, Harrisburg, across America get access to the federal information that will enable them to track illegal guns,because the numbers are astounding. Probably 80 percent of the guns used in gun crimes are in the hands of that criminal, that gang member– unfortunately, people who are sometimes, you know, mentally challenged — because it got there illegally. And under the Republicans, that information was kept from local law enforcement.So I believe that we can balance what I think is the right equation. I respect the Second Amendment. I respect the rights of lawful gun owners to own guns, to use their guns, but I also believe that most lawful gun owners whom I have spoken with for many years across our country also want to be sure that we keep those guns out of the wrong hands.And as president, I will work to try to bridge this divide, which I think has been polarizing and, frankly, doesn’t reflect the commonsense of the American people.So we will strike the right balance to protect the constitutional right but to give people the feeling and the reality that they will be protected from guns in the wrong hands. MR. GIBSON: Senator Obama, the District of Columbia has a law,it’s had a law since 1976, it’s now before the United States Supreme Court, that prohibits ownership of handguns, a sawed-off shotgun, a machine gun or a short-barreled rifle. Is that law consistent with an individual’s right to bear arms? SEN. OBAMA: Charlie, I confess I obviously haven’t listened to the briefs and looked at all the evidence. As a general principle, I believe that the Constitution confers an individual right to bear arms. But just because you have an individual right does not mean that the state or local government can’t constrain the exercise of that right, and, you know, in the same way that we have a right to private property but local governments can establish zoning ordinances that determine how you can use it. And I think that it is going to be important for us to reconcile what are two realities in this country. There’s the reality of gun ownership and the tradition of gun ownership that’s passed on from generation to generation. MR. STEPHANOPOULOS: Senator Clinton, you have a home in D.C.Do you support the D.C. ban? MR. STEPHANOPOULOS: But what do you think? Do you support it or not? SEN. CLINTON: Well, what I support is sensible regulation that is consistent with the constitutional right to own and bear arms. MR. STEPHANOPOULOS: Is the D.C. ban consistent with that right? SEN. CLINTON: Well, I think a total ban, with no exceptions under any circumstances, might be found by the court not to be. But I don’t know the facts.But I don’t think that should blow open a hole that says that D.C. or Philadelphia or anybody else cannot come up with sensible regulations to protect their people and keep, you know, machine guns and assault weapons out of the hands of folks who shouldn’t have them. MR. GIBSON: Well, with all due respect, and I’m not sure I got an answer from Senator Obama. But do you still favor licensing and registration of handguns? SEN. CLINTON: What I favor is what works in New York. You know,we have a set of rules in New York City and we have a totally different set of rules in the rest of the state. What might work in New York City is certainly not going to work in Montana. So, for the federal government to be having any kind of, you know, blanket rules that they’re going to try to impose, I think doesn’t make sense. MR. STEPHANOPOULOS: But Senator, you were for that when you ran for Senate in New York. SEN. CLINTON: I was for — I was for the New York rules, that’s right. I was for the New York rules because they have worked overtime. And there isn’t a lot of uproar in New York about changing them, because I go to upstate New York, where we have a lot of hunters and people who are collectors and people who are sport shooters; they have every reason to believe that their rights are being respected. You walk down the street with a police officer in Manhattan; he wants to be sure that there is some way of protecting him and protecting the people that are in his charge. Posted in Barack Obama, Bernie Sanders, Democrats, Hillary Clinton, Iraq, Politics, Scandals. Tags: Barack Obama, Bernie Sanders, Democrats, Gun Control, Hillary Clinton, Iraq, Politics, Scandals. RSS feed for comments on this post.. TrackBack URL.